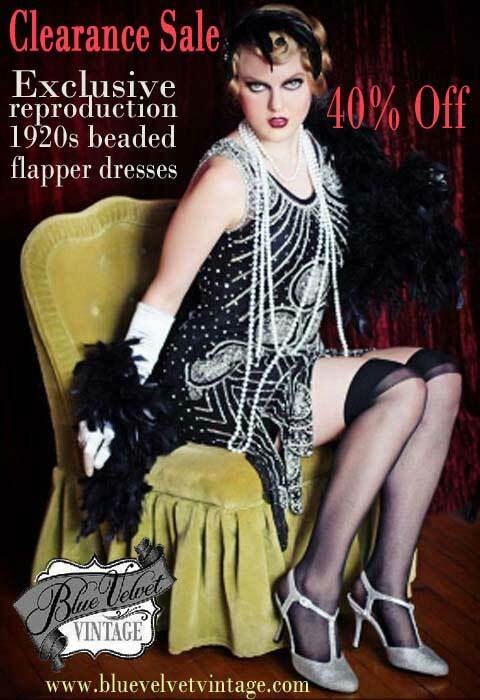 1930s fashion - Recreating a Joan Crawford 1935 dress suit. 1930s fashion – Recreating a Joan Crawford 1935 dress suit. A while ago I stumbled across a vintage costume designer by the name of Anushka Tay. 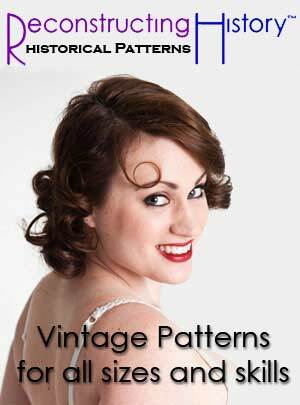 In the admittedly self indulgent and rather fluffy realm of vintage fashion blogs this girl caught my attention. In the course of her third year research she has devoted some considerable time and energy to studying and recreating – so far – two 1930s costumes – specifically a 1935 Joan Crawford suit and a 1930s bias cut evening dress. 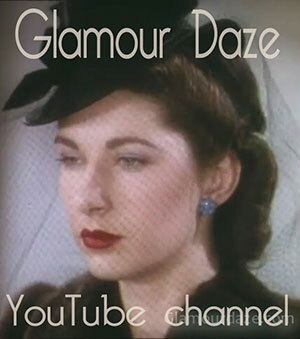 Now while Glamourdaze declares itself an ‘archive of vintage fashion and beauty‘ and makes no pretense at any knowledge whatsoever on the learned art of clothing cut and construction, we do try on occasion to squeeze the brain cells a little. Anushka has very kindly agreed to be interviewed. 1930s fashion – Recreating Joan Crawford’s 1935 suit. 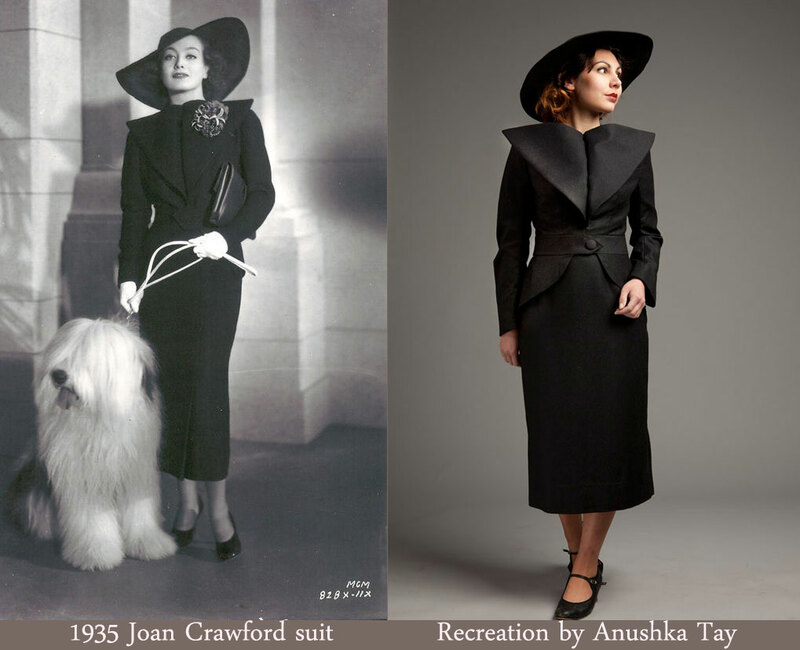 Hello Anushka – cutting to the point – awful pun I know – why the 1930’s in particular and what brought this Joan Crawford suit to your attention? The early 20th century has long been my favorite period in historical costume, and the 1930s is of especial interest as it represents one of the last eras with real dictated customs and rules regarding dress as associated with social position, gender and etiquette. It also encompasses a wide range in cutting techniques, some of which were experimental and some more traditional. 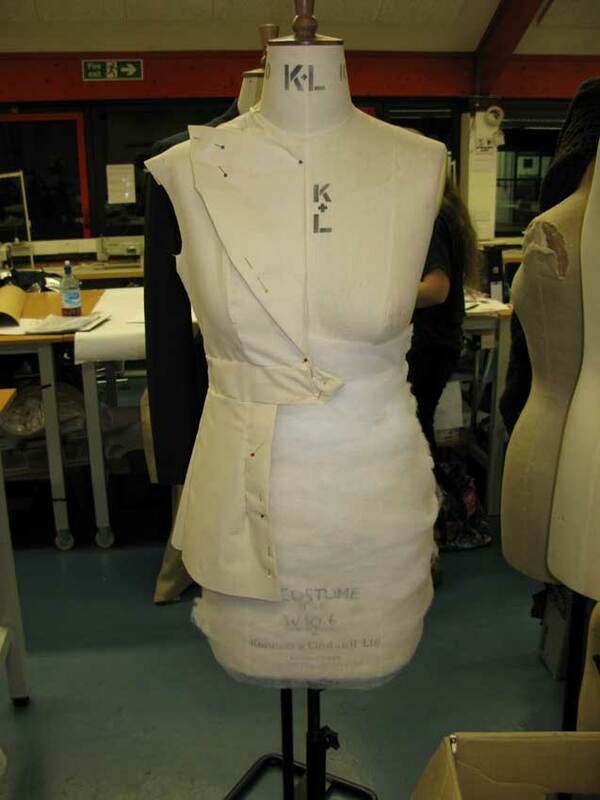 For my final degree project, I was looking to expand my knowledge of tailoring by applying it to women’s wear. 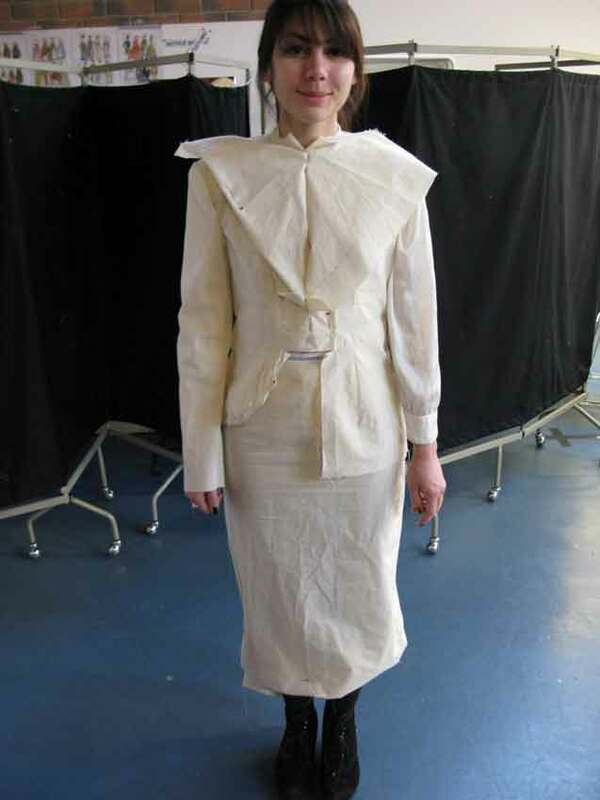 Typical suits of the 1930s and 1940s simply recreated masculine style lines but with a skirt; I was seeking to challenge myself and was intent on creating a piece of tailoring which was unusual and striking, and which would really force me to consider how to apply my knowledge of the craft in more conceptual situations. I felt that this suit was an excellent example of period Hollywood costume, and Joan Crawford’s costuming. Did you find out who designed the one we see her wearing here or some history to the style’s origin? Gilbert Adrian is the costume designer for the film ‘No More Ladies’ (dir. Edward H. Griffith, 1935). 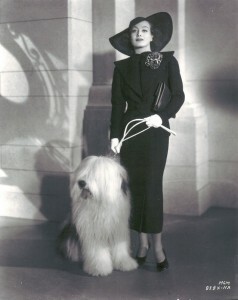 In the 1930s and 40s, a suit was seen as the ideal travel outfit, and so Crawford’s character wears this suit in the scene where she waits at the station for the train to take her to the countryside for the weekend. The exaggerated lapel feature is reflected and repeated in many other costumes she wears in the film. One observation we have to make – which you also point out in your introduction – is that while the ridiculously wide shoulder lapels and sleek above the ankle skirt is very typical of the 1930s -the overall line seen in Crawford’s suit here does not seem to typify the 1930s silhouette. 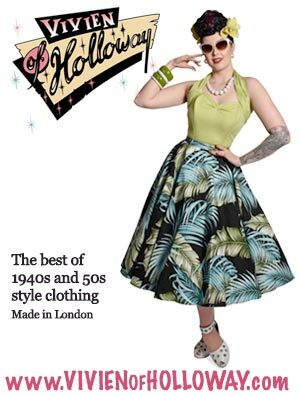 We see the wide shouldered look of the 1940s – yet it’s only 1935. Was there a specific month / year when this look first materialized. 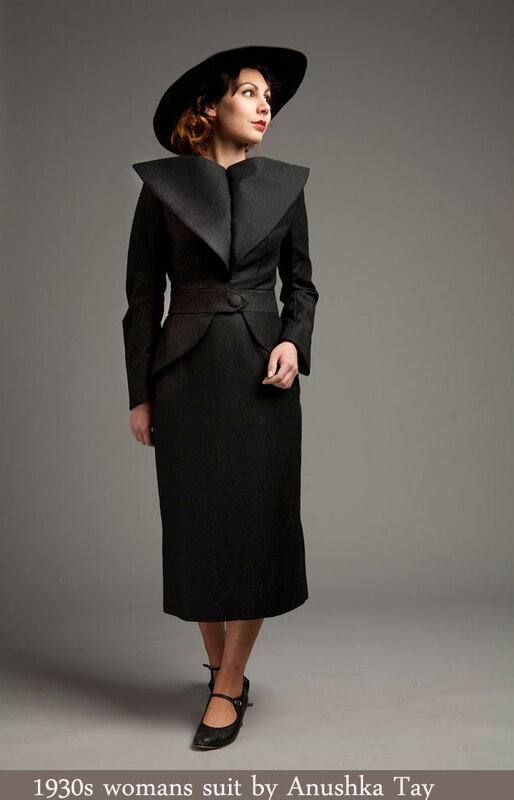 I’ve read that Schiaparelli was an early exponent of shoulder padding. I think it’s important to state the fact that there is rarely an exact date when certain ‘looks’ first materialize. Aside from the fact that fashion continually borrows from the past (For instance, in his research process Christian Dior examined antique and “lost”19th century dressmaking techniques, re-introducing boned bodices,corsetry and the crinoline), it takes time for ‘looks’ and silhouettes to filter down through various strata until they become the general image of the age; these ‘looks’ are often strongly influenced by the contemporary social and political issues. 1930s fashion, especially in film, was often very extravagant – and much more daring and forward-thinking than is often remembered. 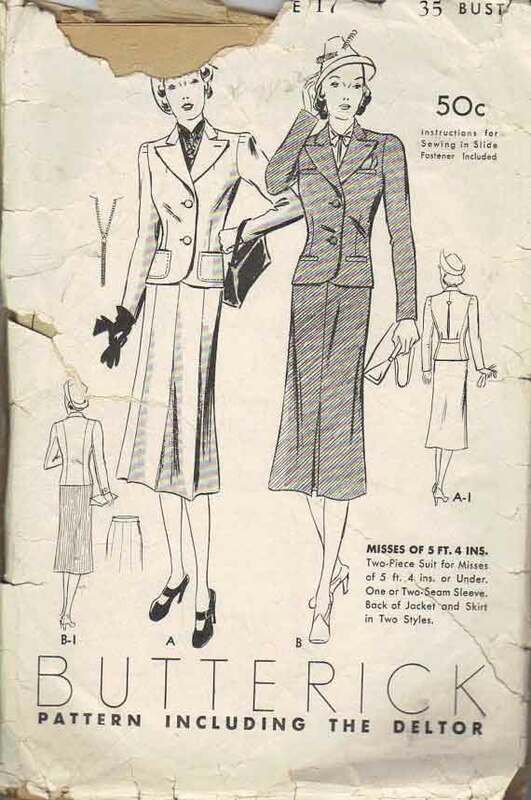 The emphasis placed on the shoulder was indeed extremely common in the 1930s, often with huge puffed sleeves accompanied by ‘butterfly’ collars. 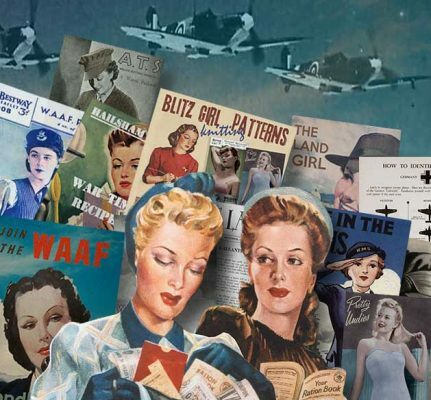 The difference, I feel, between the 1930s and 1940s shoulder padding lies in the shape, as in the 1940s the padding was generally squarer and more masculine. The 1930s was in many ways an epiphany and revival of femininity and sensuality, after the brasher and squarer lines of the 1920s. Finally, early and ‘Golden Age’ Hollywood film costume design was renown for being innovative and forward-thinking; simply because of the delay between the filming and the release. Costume designers could not use current fashions as the films would look dated by the time they were released. I therefore find it unsurprising that you feel that this suit’s silhouette reminds you of the 1940s. 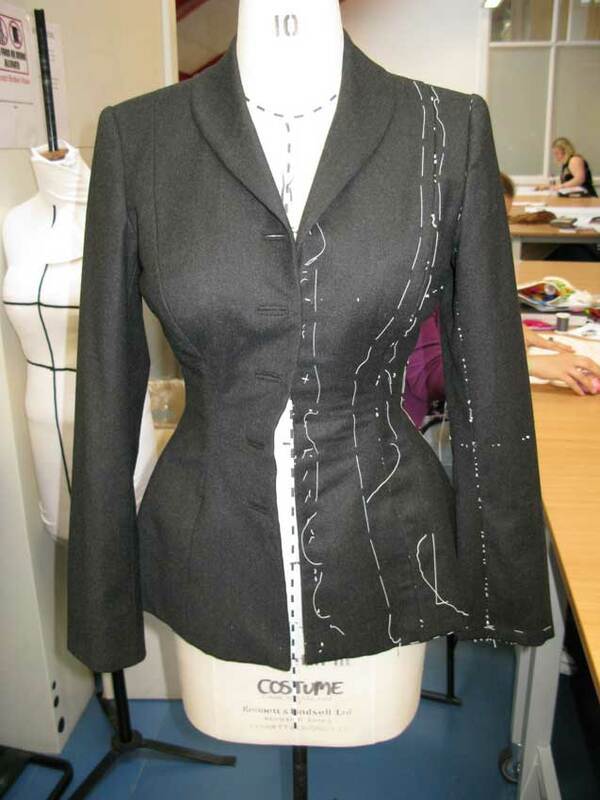 You used Photoshop to create the ‘line drawing’ of the suit and among other things, you decided to create a skirt for ‘today’s woman’ with a box pleat to allow easy movement etc. Were you satisfied with this and other design decisions? 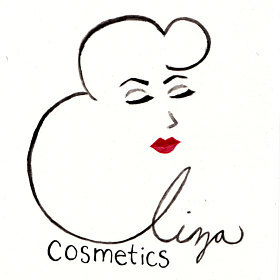 Certainly, I am very happy with all decisions I made regarding the design and making process. Many costumes made for film and photography are impractical for genuine use and movement and it’s easy to make something that looks the part but which is difficult to actually function in. 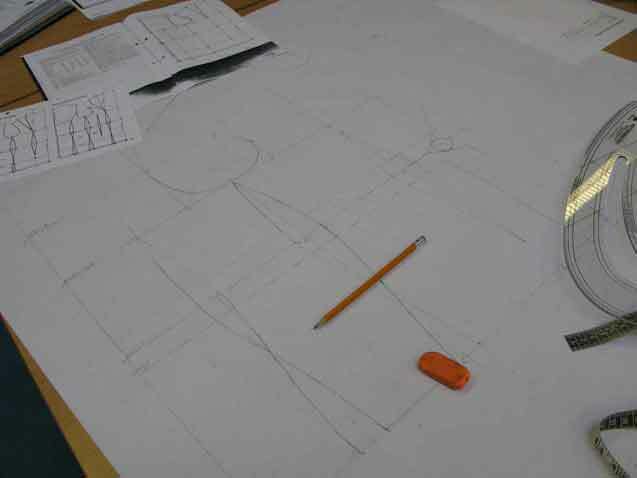 I was more interested in creating costumes that actually fit and work, and trying to solve problems that may arise in doing so. In some modern TV dramas such as Mad Men, we read of the actors wearing original underwear – yet you chose a modern girdle etc for your model. What was the process of thinking in your final choice of lingerie? 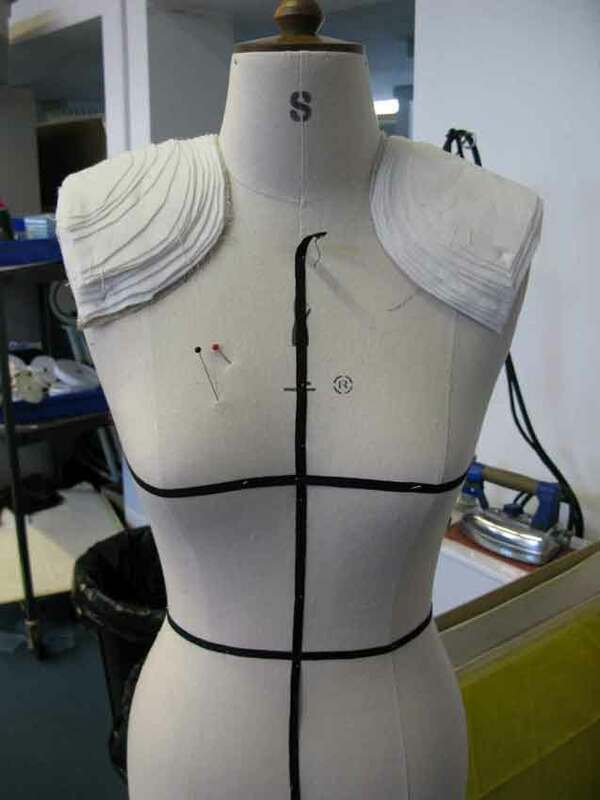 I was continuing with my efforts in creating a costume for a modern wearer. 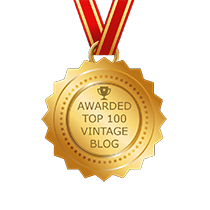 It seemed futile to try and purchase and use genuine period undergarments; I didn’t have the time to make them from scratch; and unlike 1950s girdles and bullet bras, 1930s lingerie is not really easily available from retailers. The fact that I was able to use modern underwear for this project was simply due to the silhouette required. The 1930s placed an emphasis on ‘natural’ curves (rather than a heavily corseted figure) and an idealized body shape similar to today’s: tall, slender, with slim hips and a soft but small bust. 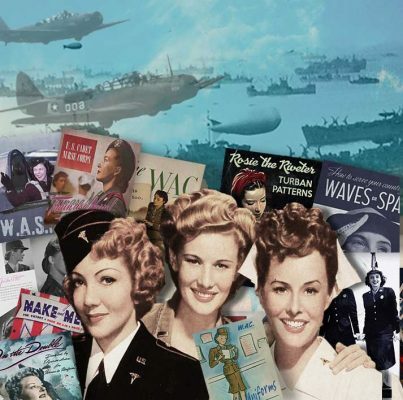 My model fit the requirements perfectly; but it’s important to note that today, as in the 1930s, an older woman, or a woman with a less-than-ideal body shape for the period, would have had to wear strong foundation garments to achieve the silhouette. Long girdles which compressed the hips were often worn, as were devices to compress the bust. The return to lower hems defines the 1930s. This pencil skirt is so elegant – its line and silhouette and single inverted skirt pleat. 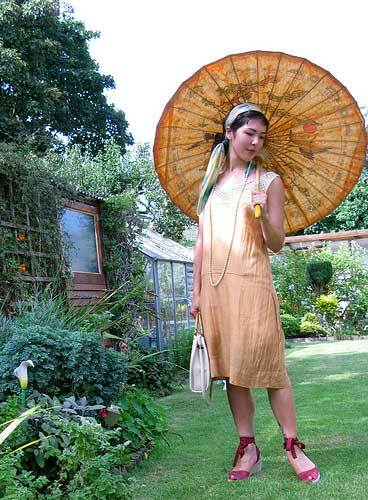 Have you any idea when this type of single front pleat skirt first appeared – the late 1920s ? Would I be correct in assuming that the minimalist angular world of ‘ Art Decoratif’ hugely impacted clothing design in the early 1930s? Certainly; the Art Deco period and influence extends to the 1930s and ‘No More Ladies’ is also known for its minimalist Art Deco sets, which seem almost to decorate the costumes. 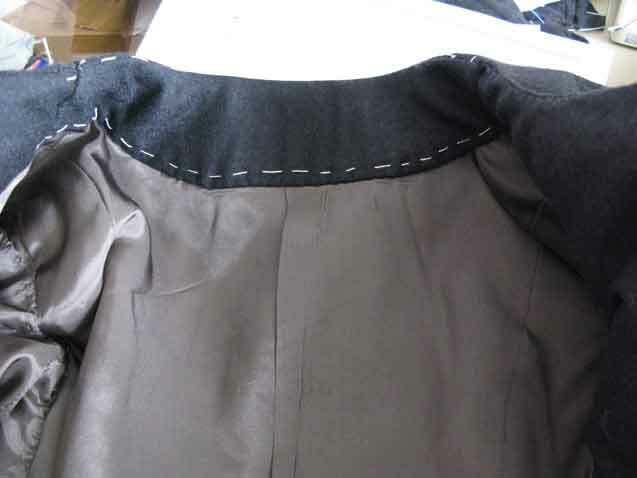 Pleated skirts are popular in female costume throughout history; pleats are an excellent device to control the placement of fullness and keep the waist small. 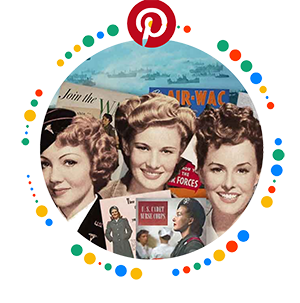 Who first popularized the ‘pencil skirt’? It certainly wasn’t Christian Dior. I would say that it has its origins in the hobble skirt of the 1910s and the fashions pioneered by early Art Deco designers such as Paul Poiret, due to the narrow and restrictive cut. 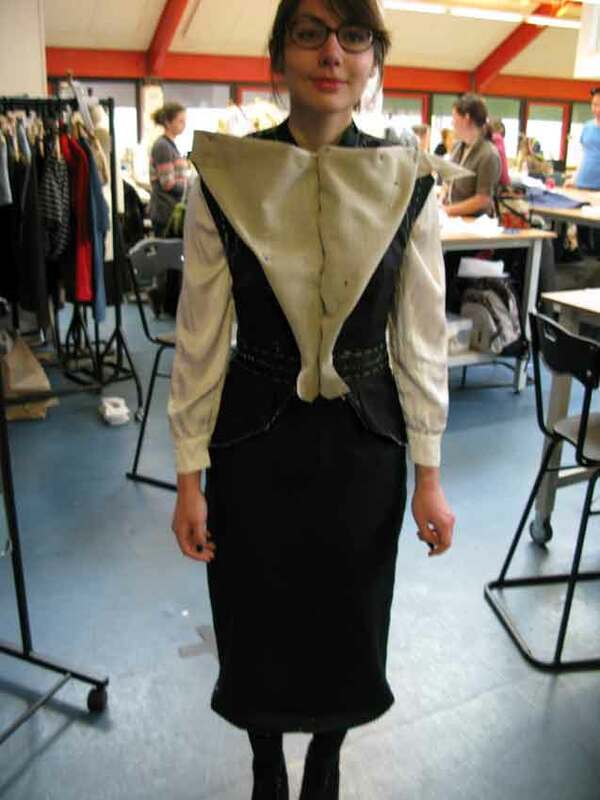 Based on your experience so far – and without giving any secrets away – can you explain the process stages an aspiring theatrical designer should follow in order to successfully create a ‘modern’ vintage outfit from scratch. Research is so important! There are many books available on historical pattern cutting, which give a fantastic and surely compulsory starting point. I will also examine film, social and documentary photography, fashion photography, magazines, periodicals and original garments from the surrounding period, and consider in depth any choices regarding the making process. Finding a suitable fabric is often the most difficult task, as period fabrics were heavier, more finely-woven and above all of a better quality than modern equivalents. Though you expressed yourself unhappy about certain elements – the finished suit I must say – to the untrained eye – is stunning – very well done! What are your career hopes and plans for the future? Thank you very much! A critical eye is imperative to the creative process, and I am always the first to find areas to improve upon in my work. I plan to continue exploring 20th century cut and construction in both period and theatrical costume order to develop my approach to craft. My especial interest is circa 1910-1959 in male bespoke tailoring, couture and more “everyday” women’s wear; I am obsessed with the idea that certain making techniques determine and control a garment’s functionality.I love working with performers, and eventually I hope to release my own collection. Remember the name – Anushka Tay – costume designer. She’ll be stepping up on the Oscar podium some day [ well if she isn’t dreaming – we’ll do it for her ! ] Thanks to Anushka for her time in answering our questions.